Is Orlando America’s Next Craft Beer Hotspot? When one considers cities known for craft brewery culture, Portland or Asheville might immediately spring to mind — but not Orlando. After all, the most popular tourist destination in the world brings to mind all things Mickey, not brewpubs. But that assumption is slowly changing with the emergence of quality local breweries and brewpubs downtown. Orlando Brewing is the only organic beer brewery in central Florida, operating in accordance with the German Purity Law of 1516 (the Reinheitsgebot). Located just west of the Amtrak/SunRail station, a few blocks from downtown, the location is a bit industrial, but as soon as you enter, a “Cheers”-like ambiance takes over. The taproom does not serve food but pizza and/or wings can easily be ordered from Brick & Fire Pizza, just down the street. They use Orlando Brewing’s Organic Red Ale in their crust and will deliver to your table, providing a partnership that’s a win-win for all involved. (We now have a new pizza fave in town.) Each weekday, at 6 p.m., tours are available and provide an ample education in how to properly create an organic brew using beer’s most important ingredients, water, hops, barley and yeast. 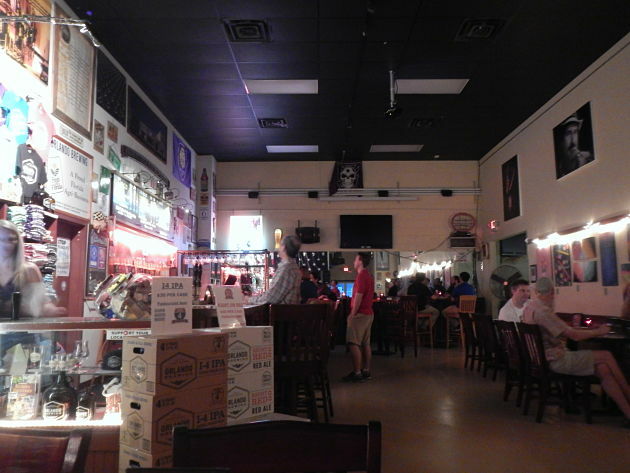 PHOTO: Orlando Brewing Tap Room. Our charming tour host, James, was delightfully energetic and knowledgeable about his product, all the while sipping from his favorite, Blackwater Porter, brewed with organic chocolate malt and roasted barley. He would occasionally stop for a drink and appropriately, and appreciatively, belch under his breath during his hour-long lecture. A fun side-note to his discourse, in the spirit of recycling, at the end of each day they take their “spent” barley to a farm in Deland which uses it as a nutritious feed for the animals. In return, the brewery’s employees enjoy farm-fresh eggs and vegetables. Yet another win-win. Ten10 Brewing, located in Orlando’s Mills50 District, is a family run brewery complete with toddlers toddling among the fermenting kettles. 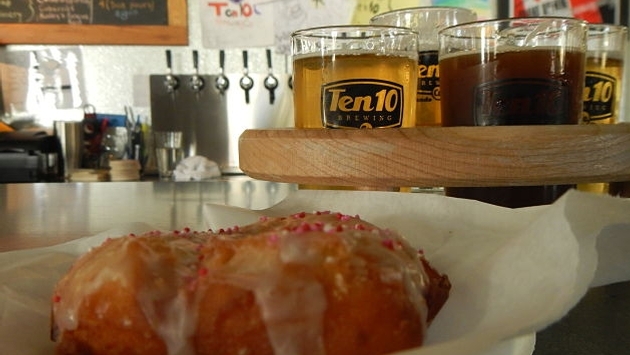 We stopped by on a Sunday morning for a Ten10 Brewing tradition, Donuts & Beer. As unlikely as that combination sounds, we paired a dark brew, Chronically Mismanaged (a Happy Red Ale, brewed with locally-roasted Lineage coffee from the East End Market) with an unbelievably delicious donut (from Orlando’s Smiling Bison). The smoky coffee, chocolate flavors of the beer seemed to intensify the sweetness of the donut and made for an uncommonly tasty experience. This brewery’s menu offers snacks, sandwiches and pizza, along with T-Bone’s Root Beer, named after one of the proprietor’s sons, should you prefer a non-alcoholic brew. The building is adjacent to the Dinky Line Trail, a mile-long walking/running/biking path that gets its name from the narrow-gauge tracks of the Orlando and Winter Park Railway that ran between the two towns. 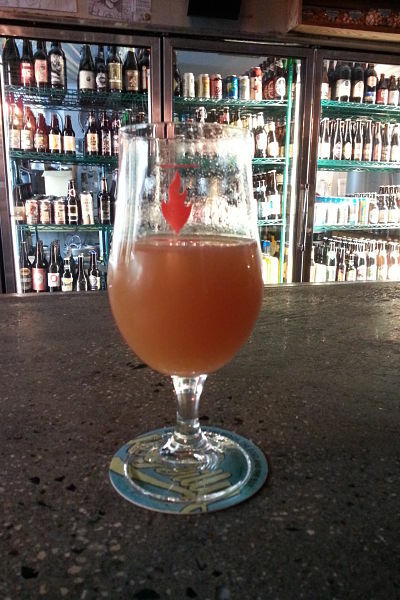 The Dinky Line Project brew is a red wine barrel-fermented modern farmhouse ale, partnering with the local Quantum Leap Winery, just down the street on the same trail. Redlight Redlight Beer Parlour specializes in wild and sour beers. Situated in the Audubon Park Garden District, just down the road from the aforementioned East End Market, this brewery occupies the old Carrier Heating & Air Conditioning building, still displaying the historic Carrier neon sign in addition to the Redlight Redlight lettering. The day we visited, they released their Super Foods Saison Beers, Quinoa Saison and The Farmer, The Farmer’s Wife & the Tapir Avocado Saison. The Avocado was my choice and proved to be a tart, tangy and cloudy brew. My cohorts took the safe route with the Gaffel Kolsch and were happy with the light, crisp and clear concoction. Redlight does not serve hot fare but each evening a food truck or two or three appears in the parking area. That night a Portuguese food truck, Bem Bom!, showed up, albeit too late for us early birders, but it whet our appetite to return. Redlight Redlight offers an opportunity to become a “beer scholar” through their Citizen Program, in which you rate 100 beers on their list, divided into three passport booklets. As you make your way through brews, ranking aroma, appearance, taste and palate, the passport will be stamped, culminating with the ultimate basic beer exam, testing your newfound knowledge. Those who pass will be designated as Citizens of Redlight Redlight. PHOTO: Redlight Redlight Avocado Saison. An interesting observation, while visiting these breweries, is the camaraderie among the local establishments and the friendly give-and-take, not only among the breweries themselves, but also with wineries, coffee houses and restaurants. While competitive, these businesses appreciate the value of local relationships while growing their own loyal supporters. These are but three of many outstanding breweries throughout central Florida. Cask & Larder, Crooked Can Brewing Company and The Hourglass Brewery are also worth a stop. Each brewpub has its own distinct personality and flavor, giving the region an eclectic reputation. Move over Portland, the city of Orlando is emerging as an important Southern hub, offering a unique craft beer experience and culture…not just a theme park tourist magnet.